Until now, in all the years I have been quilting, I can count on one hand how many solid (plain) fabrics I’ve used in a quilt. In fact, I can count on two fingers. My fear of using solids began soon after I made my first sampler quilt. Choosing fabrics for a first quilt can be highly challenging. For me, deciding on the fabric was nerve-racking. 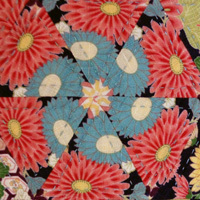 At that time, having no idea how to combine fabrics to create an exciting quilt led me to choose a few floral prints, as well as a solid burgundy fabric and a solid blue fabric. From here on used the solids in some of the blocks without fear or favour and for this reason I gave little thought to where I placed them. However, the joy I felt making this quilt was immense. Once I’d finished the quilt, my pride was so great, I lovingly displayed it on the guest bed. Sadly, my pride diminished bit-by-bit whenever I walked past the guest room. Instead of seeing my beautiful sampler quilt, my eyes were only drawn to the burgundy and the blue solids. They were taunting me. Oh, the horror, when I realised the solids were screaming, “Look at me! Look at me!”. And let me tell you, it wasn’t pretty. 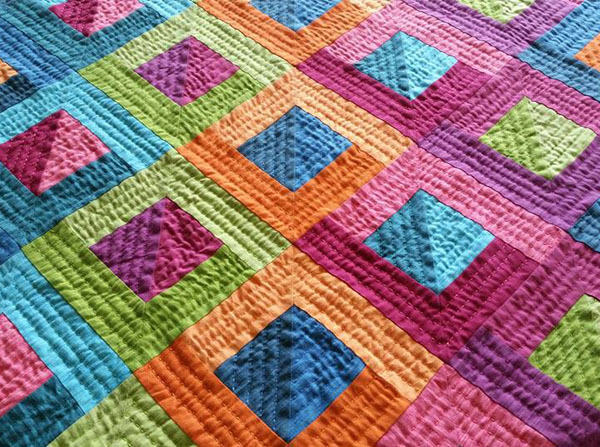 It dawned on me that solids in a quilt need to be used with care and thought because of their attention-seeking ways. Not only are they eye-poppingly obvious, especially when they are in the wrong spot, any mistakes in cutting or stitching are so much harder to hide. This was the moment I decided I would never use them again. Easy. Problem solved. In fact, my fear of solids was so great I studiously avoided using them for twenty-two years – until now. The short answer: I fell in love with the Moda Cross Weave range. As soon as I saw these beauties lined up like coloured pencils, I knew they would be mine. Obviously, I can hold a grudge as well as anyone, but the time had come to admit how glorious these attention-seekers could be when used well. A perfect example of a magnificent use of solid fabric is my grandmother’s diamond quilt. The solid black fabric used with the floral prints create an amazing 3D effect that tricks the eye. Look at the quilt from a distance – what do you see? Now click on it to have a closer look. Do you see the solid black hexagons? Or can you see the floral stars? 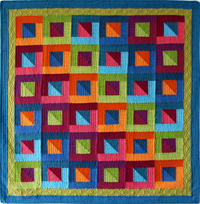 It’s a stunning quilt no matter what you see, the point is, solids can dominate a quilt (ideally, in a good way). They grab your eye. They seek your attention. This is what solids do. It wouldn’t have mattered what colour solid my grandmother used. The effect would have been just as dramatic. 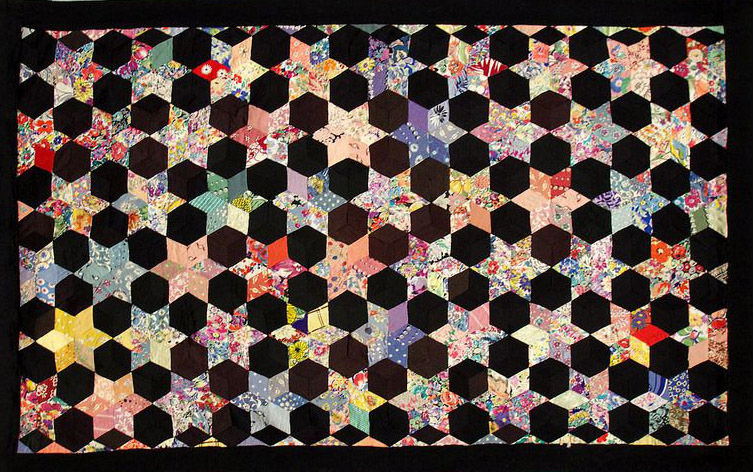 The wondrous thing about this quilt design is that the hexagons appear to float above the quilt. It’s an extraordinary effect made possible by the clever use of a solid fabric. 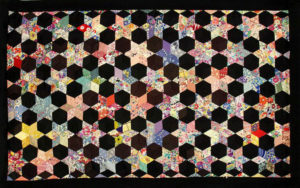 Accordingly, my grandmother’s quilt inspired me to use the Cross Weave fabrics to make a quilt with a 3D effect. I already had a block in mind for them so I arranged the fabrics into a spectrum and accordingly, the Shadowplay design fell into place. There are six different colours with a light and a dark in each colour. This means twelve fabrics in total. The simplicity of the design relies on the clever placement of the light and the dark fabrics to create a shadow in each block. The six blocks are repeated six times in all and placed on the diagonal. 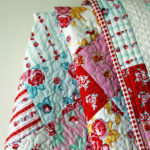 Once the fabrics were chosen, Shadowplay was quick to make and the big-stitch quilting took less than a month to finish. We quilters love fabric. We spend hours shopping for them, stroking them and dreaming about them. However, many of us don’t feel the same way about solid or plain fabrics. Often, we see them as boring, or we are afraid to use them. However, these attention-seekers have so much to offer. 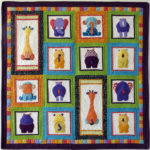 They can be used across the full range of quilts from traditional to modern and are worth considering. Make your own Shadowplay Quilt. You will love it!